Ok I know we don’t usually do recipes, but I figured I would share this review of a recipe that I have recently tried. Its quite simple and comes from the same book that my Simply Delicious Pork recipe came out of. This one was of chicken and rice, probably two of my most favorite things to eat. This one was an easy peasy recipe that was quick to prepare and tasted great. I love crock pot meals because its basically a fix it and forget it meal. If you’re a busy mom or a working mom they are a great way to be able to fix it up in the am and by the time you get home from work its ready to eat! I did not have dried celery so I used celery seed. It was still good. I used tenderloins just because that is usually what I have in the freezer. I also added a tiny bit of shredded cheddar. The chicken is super tender, so much so when I tried to cut it, it was more like shredding it. The rice of course is completely cooked. Pros: It tasted great, it was quick, it was easy, it was lo-cal. It was enough to make 6-8 servings making each serving between 328-246 calories!! (according to myfitnesspal.com). Its cheap! $.79 per can for the cream of chicken soup, rice varies depending on the size and same with the chicken.. Rice is usually something I have on hand as well as chicken. So its usually just the soup I have to grab. Cons: someone may have texture issues being it is a bit mushy. Overall: it’s a great little dish. It can be changed in the easiest ways to make it to your tastes. For example you could use cans of cheddar cheese and cans of cream of broccoli, throw in some shredded cheese and some broccoli and you have a chicken, broccoli and cheese dinner. Or use cream of mushroom and throw in some mushrooms, the possibilities are pretty much endless. Get creative!! You don’t have to worry about burning it because its in the crock pot. 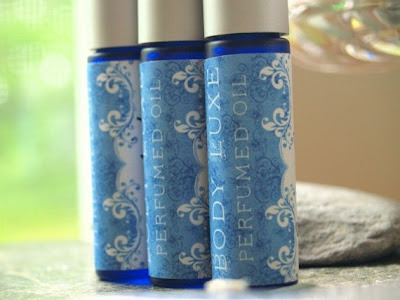 I was excited to get my little package from body luxe because they are a local company for me here in NY. It came in a very pretty little bag. 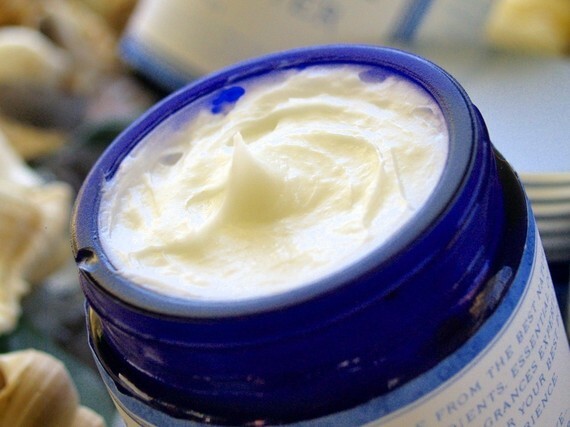 The Serenity body butter that I got was in their signature blue container. It was super creamy . Putting it on did not leave my skin feeling greasy but soft and silky.. Although it was a bit too perfume-y in the container for my liking, it wasn’t on my skin, which I was happy about, ending up being really light and clean. I would definitely buy it again because I really like how it makes my skin feel. I put it on after every shower. Serenity:::: Classic sandalwood with jasmine, cedar wood, gardenia & musk for a grounded,balanced & relaxing scent. The next thing they sent that I tried was their Minx essential oil perfume. At first smell I was a little skeptical, as it was a stronger smell and smelled something along the lines of the sandalwood but once I put it on it smelled great! 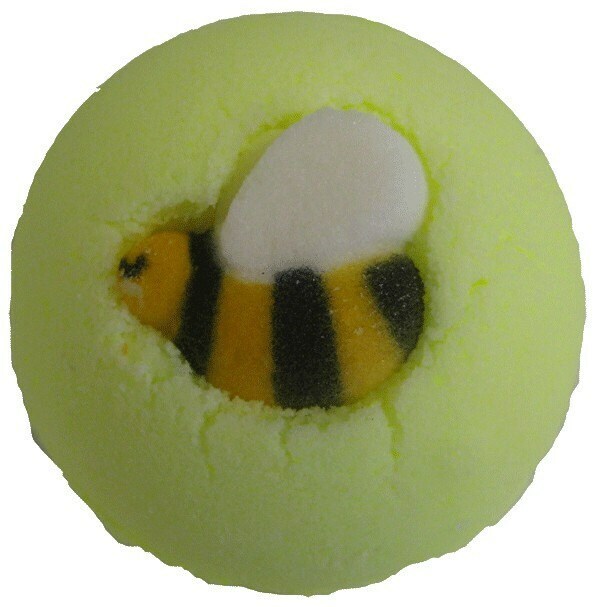 A soft kind of citrus-y smell which makes sense because it is made with the scent of orange blossoms. I really like it and use it just about every day. It comes in a little roller container so it can ride along in your purse with no spilling. It comes out smooth and doesn’t drip or run once its on. The smell dissipates over time and if you were out and about would probably need to reapply after awhile but its worth it. Minx::: Sultry, intoxicating and seductive. A smoldering blend of Neroli, Sandalwood, Musk, Bergamot and Orange Blossom. The last thing that they sent me was bath salts. The scent is Provence. It smells great. 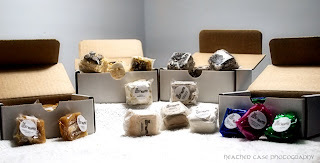 Unfortunately I have not had the chance to take bath, which is usually the case, but I very much look forward to taking a nice long bath.. Their bath salts are made from both sea salts, including dead sea salts and dendritic sea salts, and Epsom salts, grape seed and essential oils and dried flowers. Cons: the initial smell of their body butters/essential oil perfumes may be a bit strong for some but they end very soft and light. Overall: Body Luxe is a great little company. 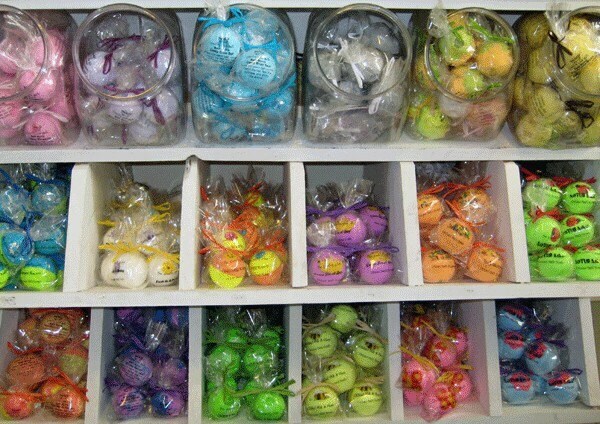 They offer a great assortment of scents that they can add to their products. 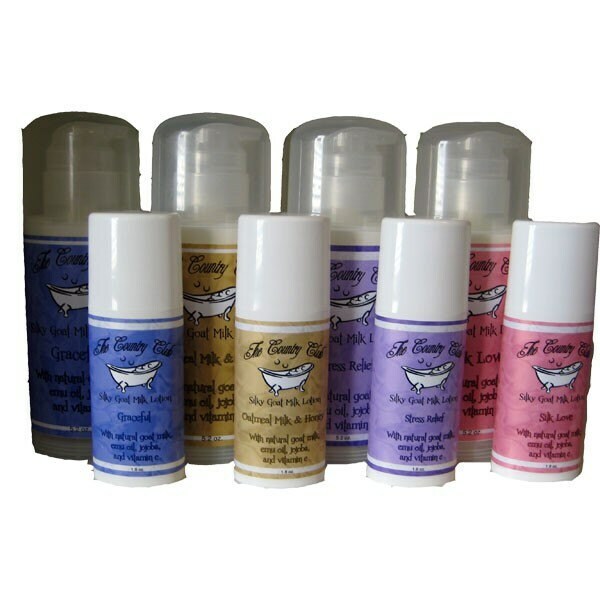 They also offer great little sampler sets that can be customized to the scent you want. 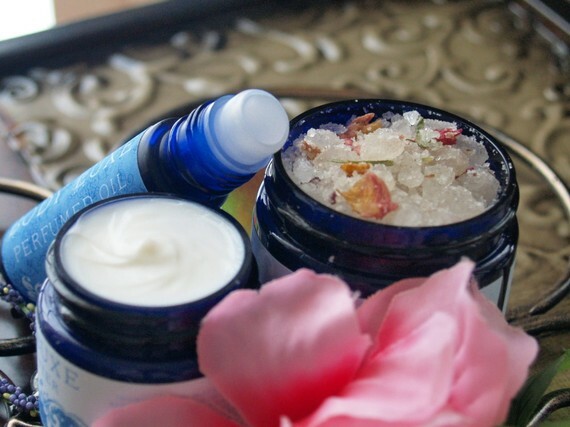 Their products look great and leave your body feeling silky smooth, your senses calm, and you smelling great! I would definitely recommend trying them out! Cant decide on just one scent or one product? Its ok they got you covered with their sampler sets! 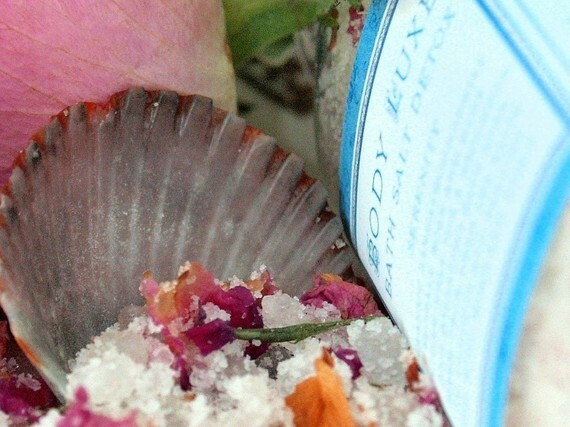 Want to try Body Luxe yourself?? Go check out their site, and give them some love! Let them know that 3G sent you! Contest will run till the 29th! Good luck everyone!! 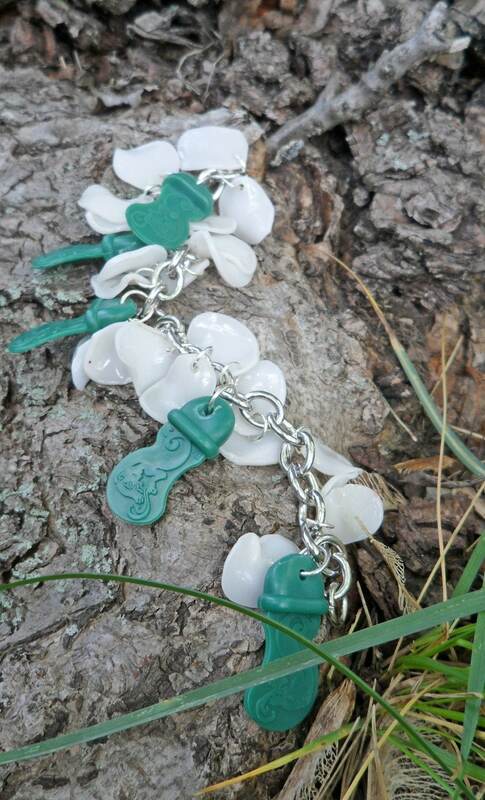 Be sure to check out her sister site, Kasia Blue for some great handmade jewelry! http://www.etsy.com/shop/SoAppealingHello its Robyn back in action. My computers both crashed on me only to find out it was a router issue so I'm back up and running and i just want to say i missed you guys so much. I love my position here at 3G and our readers are the BEST. Anyway now its time to get down to the reviews. 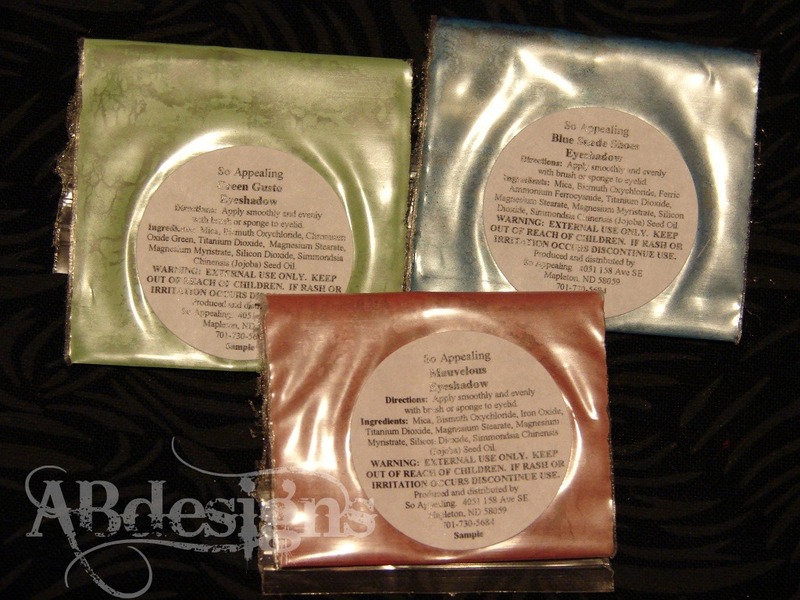 I purchased some eyeshadow samples from SoAppealing on etsy. I thought it would be fun to just give them my skin/hair/eye color and let them surprise me. I got 2 collections. The first one is "Character & Charisma". It contains a vibrant blue, grassy green, and a brownish red (mauve). 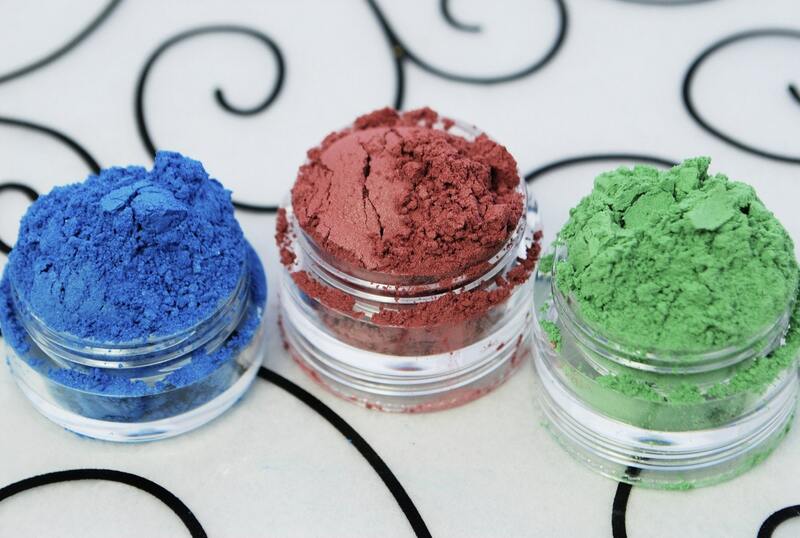 I love the blue and the green the mauve is nice in the crease as a accent color but not as a lid color on my fair skin. But all 3 colors were great and i loved playing with them. The next collection i got was "Beautifully Basic" and it really is beautiful. I love love love these 3 colors. together or separate you cant lose. 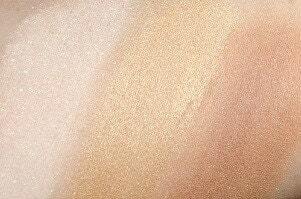 They work wonderful on my skin tone and i really think they will work for everyone. I'm down to the last few minerals in my sample bags and i definitely have to get more. These are my go to everyday colors. 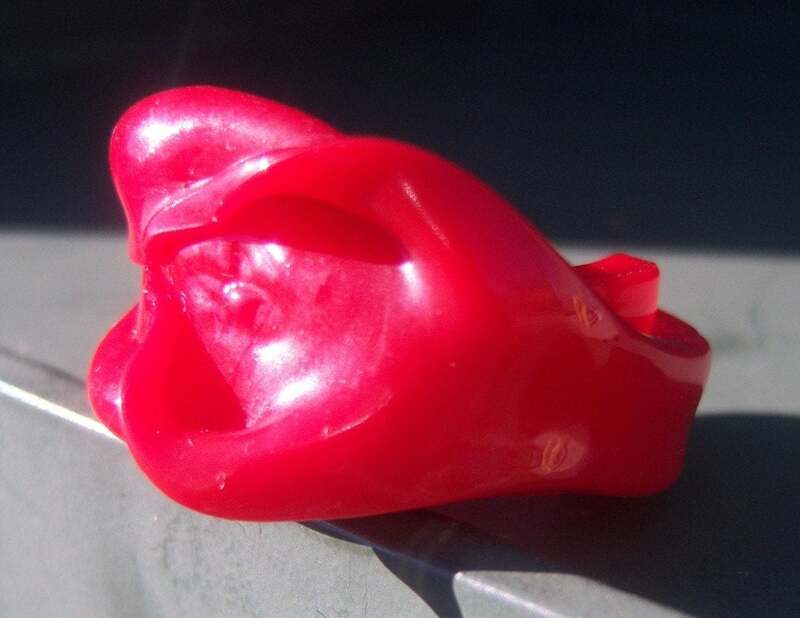 The shipping is very fast and the customer service is wonderful. You get 3 samples for about $1.65 shipped so that was very reasonable. They do come in little baggies and those of you that have been following my make up reviews know how i feel about them but aside from that i love them in every way. Please take a few minutes to stop by SoAppealing and let them know 3G sent you. While you are there check out some of their other unique items such as bath teas, oils, and salts. Good:You get a generous amount as a sample, great customer service, nicely pigmented, great silky texture, fast cheap shipping, affordable. I was contacted by Julia from Kyleigh’s Closet about doing a review on a pair of shoes called Pedoodles. I cant say I’ve ever heard of pedoodles before but will definitely be recommending them from now on. They came thru the mail very quickly with updates from the whole time from Julia. If you were a kid, these would be the shoes you want. Soft, stylish, and durable -- Pedoodles have it all. Every pair of Pedoodles is constructed of premium, top-grade, genuine leather. This flexible, breathable, natural material helps to promote healthy conditions around developing feet. Our choice of leather also requires very little care or cleaning to maintain its great looks -- something Pedoodles are known for. Kyleighs Closet is a great little shop. She has new and gently used shoes for little feet! Having two little girls who’s feet grow soo fast its hard to keep the right size shoe in our house. I hate having to buy new shoes especially because they don’t fit for long with growing feet. So here is a great alternative. She sells both boys and girls shoes, some are used some are new. 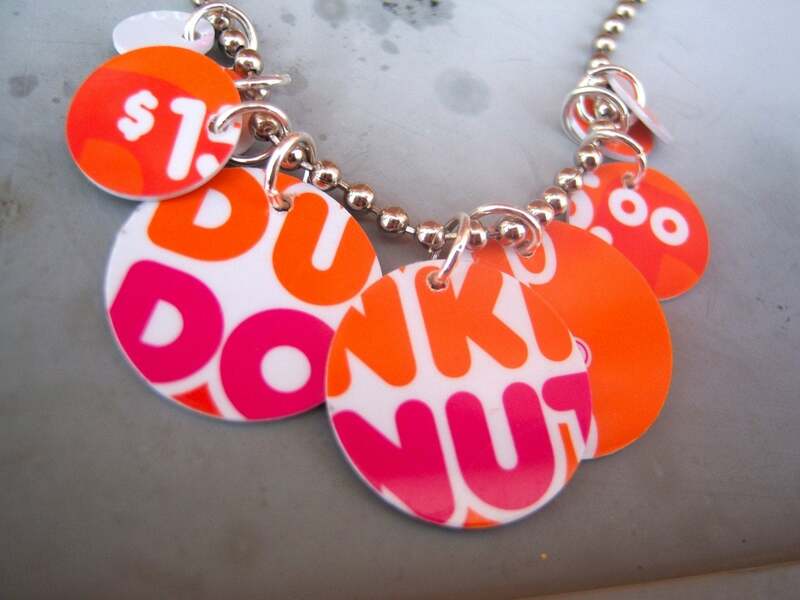 All have a description and a picture to see what you are getting and her shipping rates start at $2.50! Prices on the shoes all depend on the condition of the shoe. She also has a bargain basement section that has more worn shoes but still have life in them that can be used for outdoor play! This is a great way to be green and not buy brand new shoes and just be able to get a slightly worn pair. She has sizes that range from 0-24 months as well as 1-10. Pros: they are super soft and super flexible for growing feet. Great looking shoes, and from what I'm told feel great! No laces so little hands can get their shoes on and off with little problems.. Overall: Kyleigh’s Closet is a great little shop that sells new and slightly used shoes. They have a great assortment of shoes for both boys and girls, from newborns to a toddler 10. This is a great way to get shoes without paying a fortune when kids grow so fast and grow out of shoes very quickly. Want to get your own pair of pedoodles? Enter here for your own pair!! The winner will get their choice of either $5 or 20% off! you know what to do! The Afterglow Glassware Collection is a tribute to clean, colorless crystal. The Afterglow Collection features an elegant etched pattern. After the glass form is created from molten glass by an artisan, it is then allowed to cool. 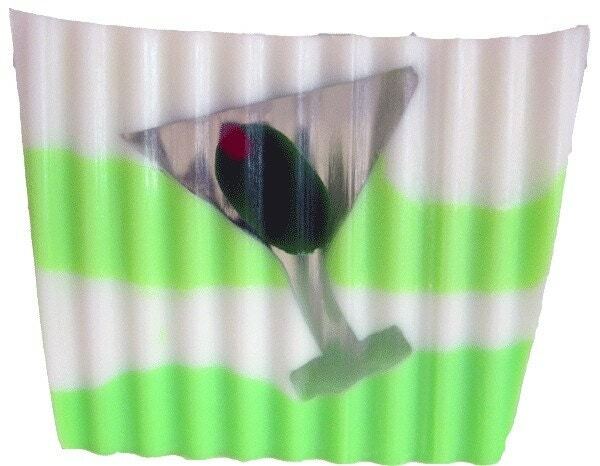 Then the matte finish at the bottom of each piece is created when the glass is dipped into an acidic substance causing the glass to be "frosted" yet smooth. Each individual piece then goes on to etching stations where craftsmen etch the lined pattern into each piece of glassware. Pieces include: Candle Cone, Champagne Flute, Halo Flute, Martini Glass, and Vase. 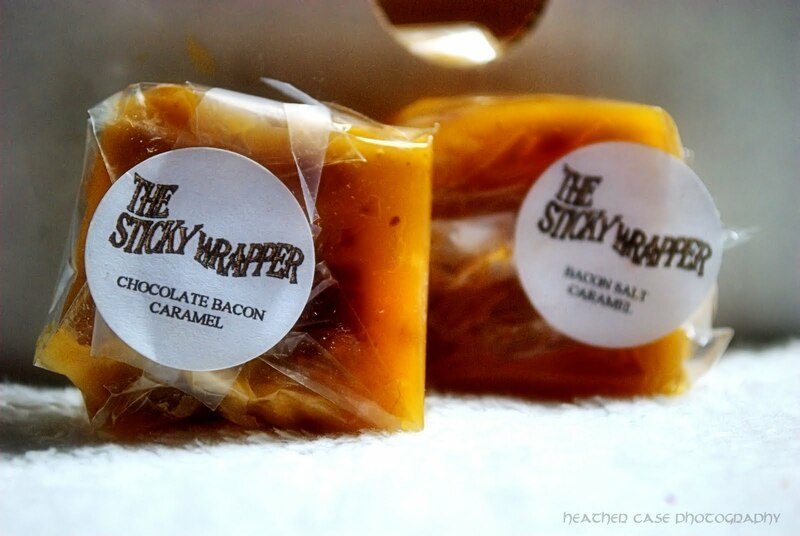 I found sticky wrapper on etsy almost by mistake, but what caught my eye and drew me to them was bacon caramels. I LOVE bacon.. I contacted them and it was decided that I would be getting a sampler pack. I was very excited and very curious about trying all of their interesting treats!! When the box arrived I was shocked at just how many Sara had sent me. Her love of candy making got the best of her!! She sent me some of each of her yummy treats both marshmallow and caramels. I couldn’t help myself and had to try the bacon ones right away! She had sent her bacon salt and chocolate bacon, both caramels. First they were huge, which is awesome! At first taste they taste great. A bit on the greasy side but she uses real bacon, (yes there is actually bacon in the caramel! )so that it to be expected. Don’t get me wrong its not like they are dripping in grease nor do they taste like grease you just notice it on the wrapper. However, I was not crazy about the after taste. I cant even really explain the taste either. It wasn’t bad, it was just not something that I liked. I would say they are worth the try if you like bacon.. I love the concept of the sweet and salty wrapped up in one. The next one I tried was the lemon and lavender. I really like it subtle hint of flavor, very light, finishing clean. The caramel itself is creamy and like the bacon was big. Actually all of the candies were big pieces, which to someone like me who has a sweet tooth is not a problem. I also really liked the pineapple upside down cake caramel. Very interesting texture but great taste! This one also creamy with tiny bits of pineapple.. It was very yummy! She also sent me a Nutterbutter one which if you are peanut butter lover definitely try!! The rest of what she sent me were marshmallows. They were all very yummy.. Huge homemade marshmallows. One was a s`more. It was a marshmallow with graham cracker crumbs, and chocolate chips. Bite down, insta s`more!! The next one was cookies n cream which had Oreo crumb crumbed on top as well as inside. I think that one was my favorite. Maybe not the mocha one I think might have been my fav… it was soo different to have it taste like mocha yet still be the marshmallow texture!! That also goes for the creamcicle great taste of creamcicle with the texture of the marshmallow making me feel like a little kid again!!! Of course my kids absolutely loved them!! Pros: great little candies! Very different from anything I have ever had. 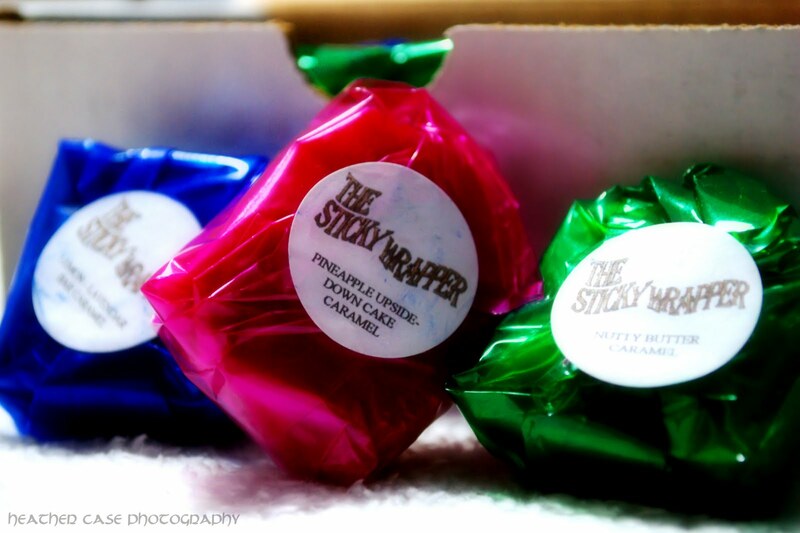 Overall: The sticky wrapper is a great little candy store. Very unique candies that I highly recommend to anyone who has a sweet tooth! Sara is very sweet and loves her work. She has a great assortment that she didn’t send me. I will definitely be ordering some of her other treats. There are quite a few that just look too yummy not too.. 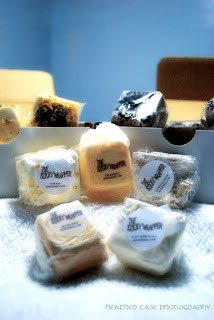 If you like caramels or marshmallow or just have a sweet tooth, go and check out her shop! Also please head over to her facebook page and show her some love!! Want a sneak peek?? Stay tuned for a giveaway from the sticky wrapper!!! Sorry it's taken me so long to write about the Fat Foam hair dye I used FOREVER ago!! I just wanted to let everyone know it works wonderfully, is affordable, and the color sticks for a LONG time in your hair! You can get it at Wal-Mart for under 10 bucks. Much easier to use than the regular stuff where you have to pour bottle 1 into bottle 2 and then into bottle 3 or whatever. Also a quick update, I am donating to the American Red Cross next week based on the # of followers we had yesterday (198) and the # of followers I had on my personal blog yesterday (226). Robyn's computer is broken so the giveaways she is working on have been put on hold. I will be drawing winners tomorrow for them probably. Thanks for all your help and support!! I got a package from Mademoisellemermaid the other day. Of course I couldn’t wait to open it because I could wait to check out the crocheted fingerless gloves she sent me!!! I love them. I don’t know about you, but I hate when my hands get cold, and for me its usually the only thing that gets cold.. I cant wear gloves because then I cant type.. If I do it ends up all messed up and very frustrating. 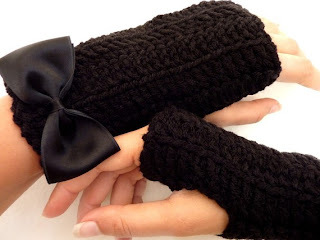 We I came across MademoiselleMermaid and found her fingerless gloves and had to check them out!! I thought what better way to keep my hands warm and still be able to type! I was very right! They are soo cute!! Very nicely crocheted and they even come with a little bow at the bottom. The bottom comes to just above my wrist, so it’s a really nice length. They are very soft and comfortable to wear. I can type away with no interference from them which is great because as you can imagine I do a LOT of typing. They don’t get itchy or anything like some gloves after wearing them for awhile, for that matter I forget that I even have them on. They are super stretchy because they are double stiched crocheted. 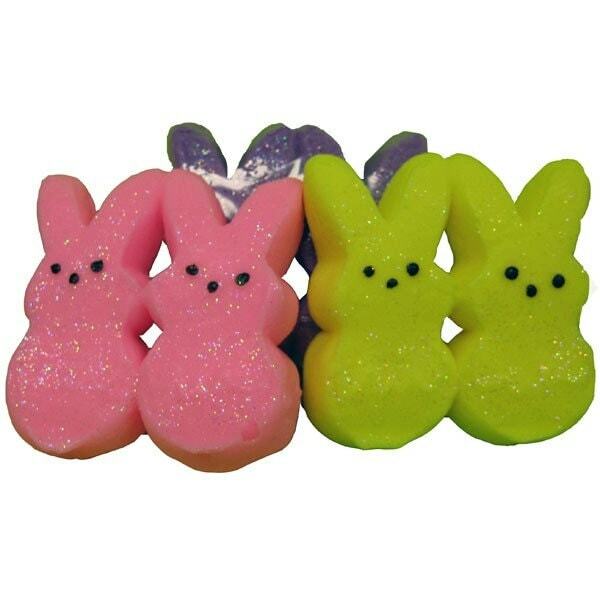 They come in an assortment of colors too so you can choose your favorite color! The best part they are washable!! You can hand or machine wash in cold on the gentle cycle of course. Just make sure you turn them inside out J. You wouldn’t want to lose the little bow! MademoiselleMermaid has soo many cool things on her sight! You just have to go check them out! From hats to crocheted leg warmers and something for everything in between! She has great little wrist cuffs! Made of lace and beads that you have to check out!! Do you like Alice in Wonderland? Check out her selection of Alice in Wonderland stuff! Wrist (shown to the right) and ankle cuffs, tanks, chokers and more!! Pros: They are awsome! They look great and feel great! 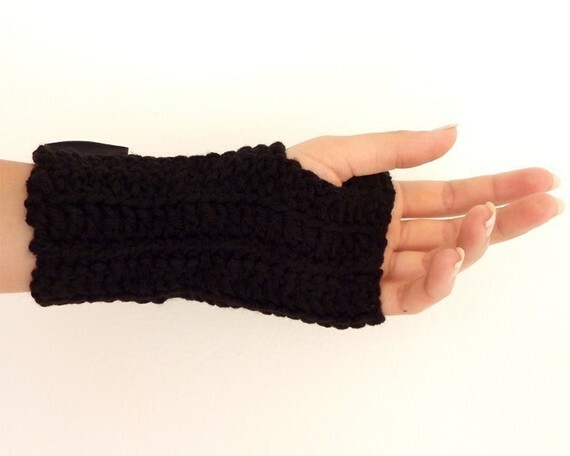 They keep your hands warm while still allowing you to do things. Great prices and low shipping! Overall: Great Product for a great price! Great assortment of items that really cool! Great customer service and quick shipping! Want your own pair of gloves? Enter for your chance to win your choice of color fingerless gloves!! You know what to do!! Extra chances for liking their facebook page and showing them some love!! Also you can follow them on twitter! They also have a blog and thier website as well as an etsy shop you can check out!